The photo is taken at the Kettleman City Supercharger station which has lately been a spot for various Tesla Semi Truck spottings, like the most recent red Tesla Semi. It is interesting that employees link to companies like Daimler are also praising the Tesla Semi electric-truck, besides recently Daimler CEO downplaying Tesla, saying the trucking business is not easy and Tesla will have a hard time penetrating the market. we are making great progress, just launched our LiveWire motorcycle, the first electric connected large motorcycle. Seems like Harley-Davidson is well aware of the electric vehicle disruption and moving in the right direction to embrace the change, at the same time several big players are in denial and probably will meet the fate of Nokia and Kodak. 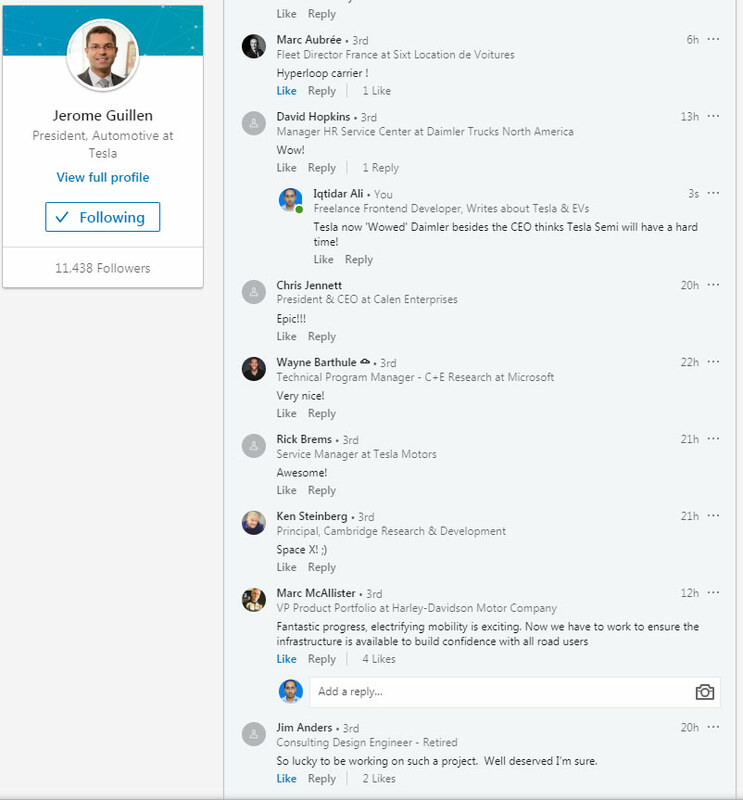 LinkedIn comments screenshot on Jerome Guillen's post by industry peers. 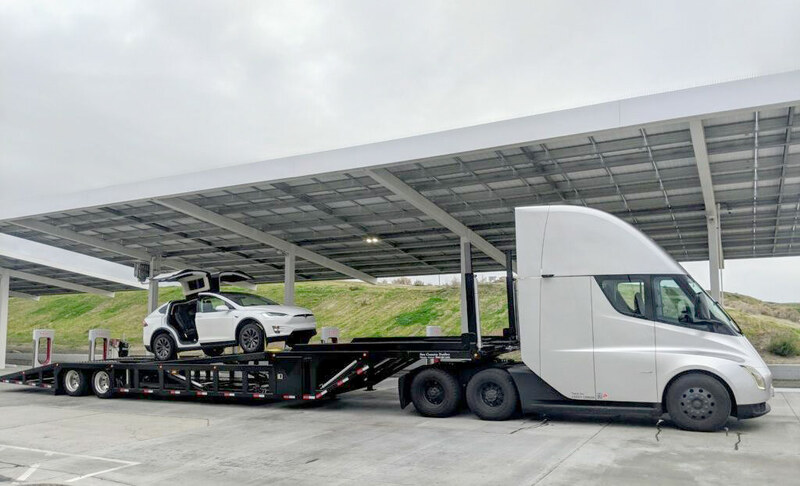 The above picture of the Tesla Semi with the Model X shows the attached trailer having a slope at the rear end, possibly Tesla’s version of a car carrier which Jerome hints as ‘Aircraft carrier’. What this picture also suggests is that we will see Tesla Semi Trucks delivering Tesla vehicles to the Tesla Showrooms in the future but first Tesla will have to deliver more than 600 Tesla Semis to customers worldwide who have placed pre-orders with huge amounts of money. Tesla Semi Truck has been doing test cargo trips between Tesla Gigafactory in Nevada to the Tesla Fremont Factory since March last year — the electric truck from Tesla is also seen doing insane amount of acceleration on the freeways with cargo trailer attached. Tesla Semi was recently shown to TCI Transportation in an organized event, who have placed a pre-order of 50 Tesla Semi electric-trucks and are playing their part in the electric vehicle adoption in the logistics industry. Tell us your thoughts about the Tesla Semi truck and its impact on the future of sustainability in the comments section below.